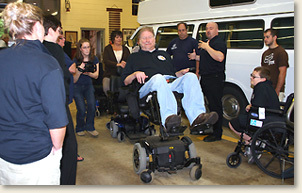 Scott Elliott, executive director of the Progressive Center for Independent Living, demonstrating how to operate a power wheelchair at their Adaptive Equipment Demo. EAD & Associates, LLC helps a wide variety of clients identify their specific needs/disaster preparedness problems; identify the reason/cause; identify and implement solutions that empower them to confidently serve their communities and constituents. Challenge: After Hurricane Katrina hits the Gulf Coast, a national disability organization seeks to investigate the status of response and recovery for the special needs populations, which included people with disabilities, the elderly and medically managed individuals. Solution: EAD & Associates, LLC, simultaneously deployed teams of nationally recognized disability and emergency management specialists to Louisiana, Mississippi, Alabama, and Texas. Another team was designated to compile and analyze data for a final report. Result: The client is able to release a report on behalf of a federal agency sponsor that will act as the basis of a multi-disciplinary and multi-agency task force to address systemic weaknesses and implement change from here forward. Click here for the full published report. Challenge: A State Emergency Management Office has to assist local agencies with developing special needs plans that can be easily integrated into the State Emergency Response Plan. Solution: Create a planning template and instructions that outline key areas of concern in developing plans that include special needs issues and provide a format for plan development. Result: State Emergency Management Office creates a master response plan that encompasses the needs of local community special needs by involving the community directly in the process and outcomes. Challenge: A community needs to develop a method to facilitate communication between people who are deaf and emergency first responders until qualified interpreter services are available. Solution: Create a communication picture board that bridges the communication gap between emergency first responders and people who are deaf. The picture board proves to also effectively enhance the communications needs between first responders and non-English speaking populations, children, people with developmental disabilities, as well as those impacted by a traumatic event. Result: Emergency first responders are able to attend to the immediate needs of people with sensory disabilities and the entire community, saving time and getting necessary needs quickly assessed. Challenge: A national disability organization seeks a means to educate emergency responders on working with the disability community specifically regarding emergency planning. Solution: Draft a 28-page guide that outlines key special needs planning concepts for emergency managers, planners and responders. Topics include partnering with the disabled community, communications, evacuation and recovery strategies, lessons learned from previous disasters, and tools and information resources for special needs emergency planning. Result: Creation of a comprehensive and easy-to-use reference document that enhances the effectiveness of emergency operations and encourages a partnership between the disability community and the emergency professionals. Challenge: A local government human services agency tasked under the National Response Plan identifies the need to educate their management-level employees in mass care as impacted by the emergency issues of special needs populations. Solution: Develop a two-day training workshop that provides critical information about the unique sheltering considerations for special needs populations and integrating these issues into existing operational emergency plans. Result: More than 400 public servants are trained in special needs response protocols, and the decision makers and response managers are better prepared to handle future emergencies in their community. "Elizabeth Davis is a high-energy problem solver who has transformed years of real-world experience as an emergency management professional and champion for people with special needs into a multi-faceted solution set to assist challenged populations during crisis events. Undaunted by the most complex crises, Elizabeth is the undisputed leader in a very small world of expertise." – Zachary Goldfarb, Principal, Incident Management Solutions, Inc.